However, don’t expect Tarifa to emulate the other coastal areas of Andalucía. With its own micro-climate and distinctly laid back feel, Tarifa has a charm all of its own. The influences from Morocco, just a short 11 kms across the Strait of Gibraltar, are everywhere. North African architecture is evident in the narrow cobbled streets of the old town. This historic centre is surrounded by the remains of the old castellated walls. Back in AD711, when Tarifa was just a small fishing town, it became the first point of the Moorish invasion of Southern Spain. Tarifa-castle. Enter the medieval precinct through the 8th century Jerez gate, the Puerta de Jerez, and wander down to find the newly restored Castle El Guzman el Bueno and the 15th century Church of San Mateo or sit and watch the world go by in La Alameda Gardens. Great tapas bars and restaurants abound in both the old and new quarters of Tarifa and there is plenty of nightlife, both on and off the beaches during the summer, to please all-comers. Sea food is, of course, a speciality and you can watch the catch of the day being brought in by the fishing boats before sampling it at one of the local beach bars. Let us assist you in finding your perfect villa, apartment, holiday home or investment property in Tarifa, Spain. For more details, call us on + 44 (0) 208 299 2722 or contact our estate agents in Spain. 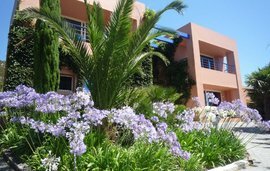 The area benefits from a comprehensive selection of hotels and places to stay in and around Tarifa ranging from contemporary boutique hotels to self-catering accommodation, from chic guest houses to exclusive secret hideaways. There are also several campsites next to the sea and others dotted amongst the pine tree woods. tarifa-dolphins. As well as the huge gamut of watersports, including surfing, windsurfing and kitesurfing, there are plenty of other leisure pursuits to enjoy. Spring and autumn attracts birdwatchers that come to spot the millions of migrating birds on their journey from Africa to Europe, or vice-versa. There are also whale-watching and dolphin-watching trips, opportunities for horse riding and rock climbing and an abundance of good walks, both along the coast and inland in the rural countryside. Along the coast to the west of Tarifa you can explore a stunning example of one of the best surviving ancient Roman ruins in Spain at Baelo Claudia, Bolonia. For those looking to fly in to access Tarifa, it can be reached from Gibraltar (a 45 minute drive), Jerez (approximately 90 minutes’ drive) and Seville airports (just over two hours away by car). Tarifa Port also has a regular and reliable car ferry service to Tangier in Morocco.